It’s the most dreaded word in the social media universe. And when you’re a business trying to drive customers to your website, it’s easy to justify someone unfollowing your business profile. You’re posting and sharing every day. You’re not sharing racist, sexist or political stuff (huge turnoffs! ), and you’re not breaking the 80/20 rule (never post more than 20% promotional information on social media channels). But what if it really is you? What if you’re breaking rules you didn’t know existed? Remember, the vast majority of businesses are just now understanding how to harness the power of social media. We’re bound to make a lot of mistakes along the way, including understanding how to engage your followers. Here’re a few mistakes that may be driving your customers away and how to easily fix them. The old rule of thumb was never post to Facebook more than twice a day. Sounds smart, right? Because you didn’t want to flood your followers feed and be completely annoying. Except, we are just beginning to understand what statistics drive social media engagement and frequency matters. And the issue of post frequency engagement depends on whether you have more than 10,000 followers or less. Businesses with more than 10,000 Facebook followers have peak clicks when they have 31-60 posts per month (more than 60 does not increase the number of clicks). But here’s where it gets really interesting. Businesses with less than 10,000 followers actually lose engagement the more they post. 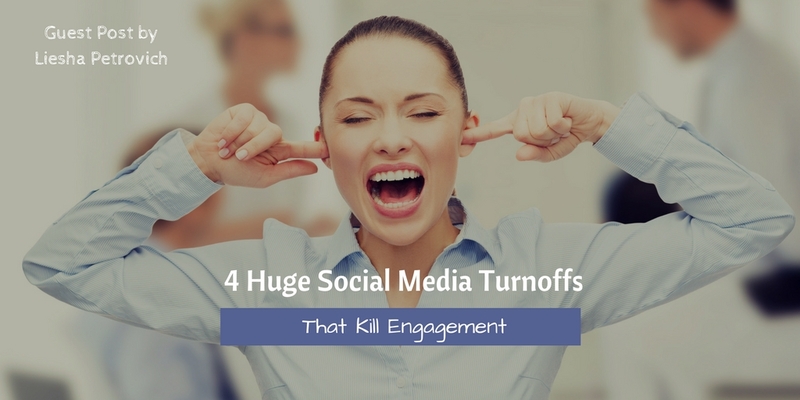 Specifically, posting one to five times per month saw the most engagement for smaller businesses! Do your homework and research frequency statistics for each social media platform you’re using. You don’t want to waste time writing 20 spectacular Tweets a day that no one actually reads. By now, most businesses understand that pictures and videos increase engagement. Tweets with images receive 150% more re-Tweets and 87% of Facebook’s engagement occurs on posts with pictures. If users love your pictures, they probably love reading about you too! So you share long, lengthy posts in an attempt to have a conversation with your followers. Except that Facebook posts with less than 250 characters get 60% more engagement! Twitter only allows for 140 characters, so the range for optimum Facebook engagement is not much longer than a Tweet. Instead of writing the next ode to your followers, opt for brevity. Be creative, funny, witty and clever. Just don’t be long-winded. Post interesting content. Share valuable information. That’s the key to engagement, right? You share a ton of interesting content across your social media platforms. In fact, you share so much stuff that you never contribute anything original yourself. When you focus on sharing only, you’re not a thought leader but someone who can easily be overlooked. Nothing’s worse than being ignored in the social media universe. It’s even worse than being unliked. At least they have enough feelings for you that they spent time unliking your page. Being overlooked because you have nothing to say is the kiss of death. Social media strategist John Rampton explains: “You want to establish yourself as an authority figure in your industry, as well as engage your audience. But you can’t do that by rehashing the work of others”. Take a stand. Share tips on how to make something better. Explain the results of a study or even the biggest mistake you’ve ever made. Be bold. I’m a huge believer in analysing data. Understanding social media statistics is the quickest way to see if your ROI is increasing or you’re just wasting your time. Except if you only care about growing your followers then you’re missing the point of social media. In the social media universe, engagement is the only thing that matters. How many followers you have or how many people like your posts will never contribute to your bottom line. I’d take 100 loyal, engaged tribe members over 1000 lukewarm followers anyday. Liesha’s a freelancer by day and Kyokushin Black Belt by night. A late-blooming academic, she’s happiest teaching business at UoPeople. Liesha’s the author of Killing Rapunzel: Learning How to Save Yourself Through Determination, Grit, and Self-Employment (her mother hates the title – but it’s a metaphor mom!). She talks business at Microbusiness Essentials and everything else at Liesha Petrovich. Get in touch with Liesha on Twitter.